Eccles train station is no longer the focal point it once was. Fire and the M602 have since reduced it to a shadow of its former self. Award winning garden displays have transformed the platforms, but now plans for a new station building and forecourt are set to improve the surroundings at street level as well. Plans for forecourt improvements were drawn up on behalf of Freccles some time ago, thanks to funding from the Eccles Community Committee. However, it was felt these should not proceed before putting a new station building in place. To enable this, funding from the National Station Improvements Programme was secured and a new Ticket Office was designed. The design was arrived at in consultations between Northern Rail, Freccles, Network Rail, Transport for Greater Manchester and Salford City Council. This has been a slow process, in part because of difficulties presented in placing a structure on a train bridge, as well as resolving issues of responsibility and ownership. However, the plans have now been approved and it is hoped that the building will be in place by summer 2013. In the meantime, the forecourt plans have to be revised to accommodate the new ticket office. With generous funding from Salford City Council, Eccles Community Committee and Northern Rail, the resulting transformation should see clear pathways to the station and more attractive surroundings. An additional, but welcome, complication is that funds have also been made available to install cycle lockers at the station. These will allow commuters to arrive on bikes and leave them in safety while traveling onward by train. Such lockers will also be appearing in large numbers at Victoria and other stations around Manchester and Salford, although some uncertainties about their number and dimensions need to be resolved. The electrification of the line that is currently in progress also brings the promise of additional trains stopping in Eccles. 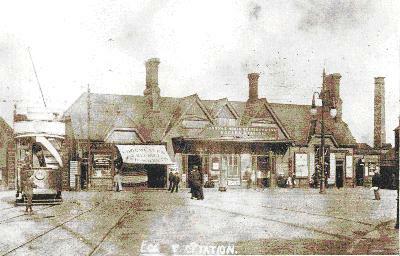 So, the prospect of Eccles station becoming more prominent focus for Eccles once again is certainly in view.